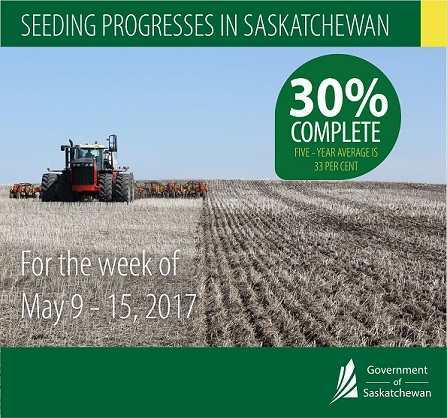 Despite recent cool and wet weather, good seeding progress was made for much of the province this past week. Thirty per cent of the 2017 crop is now in the ground, according to Saskatchewan Agriculture’s Weekly Crop Report. The five-year (2012-2016) seeding average for this time of year is 33 per cent. Seeding is most advanced in the southeast, where producers have 60 per cent of the crop in the ground. Forty-six per cent is seeded in the southwest; 19 per cent in the east-central region; 16 per cent in the west-central region; eight per cent in the northwest and four per cent in the northeast. Fifty-two per cent of chickpeas, 50 per cent of field peas, 49 per cent of lentils, 42 per cent of mustard, 37 per cent of durum and 21 per cent of spring wheat and canola have now been seeded. Some areas of the province received large amounts of rainfall that is hindering field work and seeding efforts. The Mayfair area reported receiving 47 mm of rain, the greatest amount of precipitation in the province. Fields and roads in some regions remain wet and are unable to support equipment. Warm and dry weather is needed for most producers, while others in more southern regions need rain to help crops germinate and emerge. Provincially, cropland topsoil moisture is rated as 23 per cent surplus, 73 per cent adequate and four per cent short. Hay land and pasture topsoil moisture is rated as 14 per cent surplus, 79 per cent adequate, six per cent short and one per cent very short. Producers are busy seeding, controlling weeds and trying to wrap up last year’s harvest. A complete version of the Crop Report is available online at http://publications.gov.sk.ca/documents/20/98962-Crop%20Report%20for%20the%20Period%20May%209%20to%2015%202017.pdf.